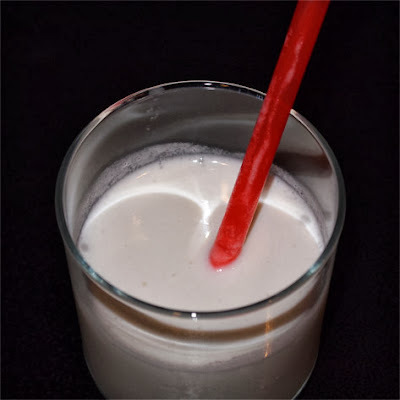 On Second Scoop: Ice Cream Reviews: Dumb Question: Can you freeze a milkshake? Dumb Question: Can you freeze a milkshake? Now we've already dived into what happens if you let a fast food shake dry out, but what if you want to save your shake for later? And I don't just mean in like an hour or so, I mean like days or weeks later. Can something that was never meant to be solid recover from this condition? 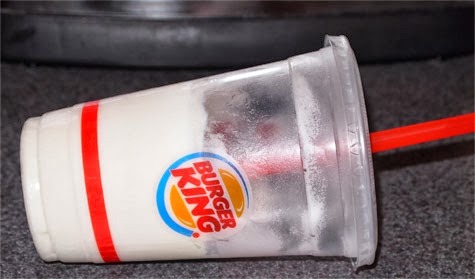 This is small vanilla shake from Burger King, and it's 3 weeks old. Now as a disclaimer I want to say that yes, in general I shouldn't have had any trouble finishing a shake, but it was really late and I just wasn't in the mood to stuff myself any further after downing my burger. So, I decided to hang on to it and see what happens. Well, after about 30-40 minutes of of sitting on the counter and occasionally stirring the shake (and breaking open the thin plastic cup because I wasn't being careful), my "shake" was ready to try once again.... emphasis on try, because I only took a few sips to confirm the fact that this liquid had gone back to tasting like shake mix and not a "real" shake. All the air is gone so it's very flat, kind of like weird tasting milk. Oh well, I tried right? So, the big question is, have you tried to save a shake? if so, have you had better luck than me? Probably the only thing you can do is stick it in the freezer and take an immersion blender to it when you're ready for it again. I have frozen a Mcdonalds milkshake before but ate it two days later so it was still fine. It didn't taste quite as good though. Have a good weekend Dubba! @Josh: Yeah, I had thought about using a real blender after the fact... maybe next time. I've always wanted to know if Dairy Queen blizzards can be frozen? It's cheaper to buy a large, so if I buy a large I can have some for the entire week. So, I pose a similar question. Can a DQ blizzard be frozen and still taste as good? @Stride: long long ago at a job far far away, every now and then we would try this with disconcerting results where you could see where the air bubbles had frozen in the soft serve. That said, I was technically trying to eat it right from the freezer and not letting it tempter for 20+ minutes. My secondary fear is that any mix-in with become kinda yucky. I freezed an Oreo shake for 2 weeks, took it out then squeezed it out of the cup into a bowl. It looked fine to me I made it melt for a bit to get it soft like ice cream. I was scared to eat it because it was in the freezer for a LONG time. But I took a bite and it tasted better than it did when I got it! And, I don’t feel sick...?